Home Page > Yardener's Plant Helper > Lawn Care For Yardeners > Basic Lawn Care Techniques > Build and Care For Soil Under Turfgrass > Is Lime Needed? In addition to the very important amendment of annual organic material, there are some additional amendments which are optional, but may be very helpful in making your turfgrass more healthy. Grass grows best in soils that are only slightly acidic, preferring a pH range of 6.0 to 7.2 (7.0 is neutral). Many soils around the United States are naturally acidic with a pH somewhat below the preferred 6.0 range. Those soils need to be treated routinely to bring the pH up and "sweeten" the soil. Check the map to see if you live in an area that typically has acidic soil. A more accurate source is your local county extension office; experts there will know what kind of soils are common in your neighborhood. It is easy to treat overly acidic soil even when the lawn is in place by spreading a layer of limestone over the turf. Limestone is naturally alkaline and it buffers the excess acid in the soil sort of like an antacid tablet relieves acid stomachs in humans. The primary reason to have the soil within the preferred pH range is to keep the microbial population happy. An acidic soil discourages microbes and therefore provides fewer nutrients for the grass plants. In addition to sweetening it, lime does many more good things for soil than people realize. It adds valuable calcium and magnesium to the soil, contributes to an improved soil structure and enhances seed germination. We recommend that you lime your lawn at least every three years even if the pH is okay; your grass needs the calcium and magnesium and can get it no other way! There are many types of lime available in garden centers and hardware stores. Chose dolomitic lime in as fine a grind as you can find. The finer the granules, the faster it will take effect. It may be gray or tan or off-white, but it must be labeled truly dolomitic lime. Some retail outlets sell bags of limestone labeled as dolomitic, but they are basically only ground marble. Since it takes at least 3 to 6 months for limestone to be absorbed in the soil and take effect, the very best time to spread it is the fall. However, it is OK to lime anytime. If your soil is very acidic (below 5.2) then you will want to apply limestone in both the spring and the fall for several years. As the pH works its way up to the ideal level, cut back to once a year or even once every two years. Generally speaking, shady areas of your lawn are more likely to be acidic and therefore will more likely need lime every year. Sandy soils that are within the proper pH range will need to be limed lightly about every 2 to 3 years. Clay soils that are within the proper pH range require heavier doses at least every 5 to 6 years. One last note on lime. 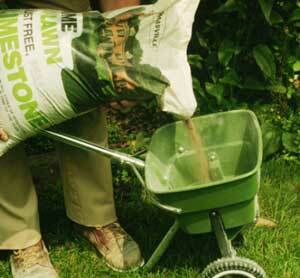 Do not spread it on the lawn at the same time you fertilize. The chemical combination produces ammonia gas which releases the nitrogen you want for the grass into the air. A very new line of products have come on to the market that actually contain the beneficial soil bacteria and beneficial soil fungi found in a healthy soil. These products can come in a powder that is mixed with water and sprayed on to the lawn according to the product label directions. When the lawn is spray with this microbial soil amendment, the microbial activity below the turf will accelerate. Disease prevention is one obvious result. Reduction of compacted soil and production of nitrogen will go faster. These amendments are not magic, but they do make a difference in improving the quality of soil if you are also adding organic material to the soil each year as well. These microbial amendments are not critical to having a perfect lawn, but they speed up the process from a lousy lawn to a beautiful lawn in 3 to 5 years. 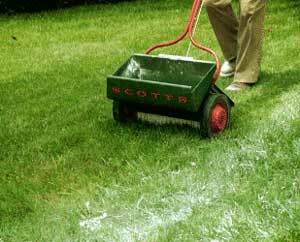 Ideally, you would apply a microbial spray to your lawn every two weeks after the last frost in the spring. That is about 8 applications in the season. If you only apply the microbial spray every 3 or 4 weeks in that first year, you are still doing good for the soil and the lawn. The idea is to reduce the number of applications each year in the succeeding years so that by the 3rd or 4th year you can stop applying microbial amendments because you soil has all the microbes needed from natural sources. Go to Yardener's Tool Shed to get information about microbial soil amendments. Click here.